Before we know it the leaves will start to change colors and begin to fall. In that, you know that the holiday season is about to start. A hearty Thanksgiving feast with all the trimmings, desserts galore and many family gatherings over the month. 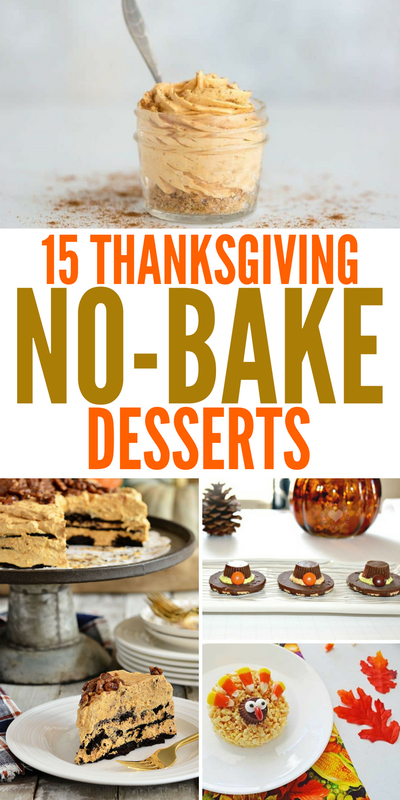 If you sometimes dread the prep work it takes to make the desserts and sides, consider these Thanksgiving no-bake desserts that are perfect for the non-baker. They are adorable and fun, and best of all tasty! No one will ever have to know it was a cinch to make. From bite-size treats, dips, and pies, and all things in between. 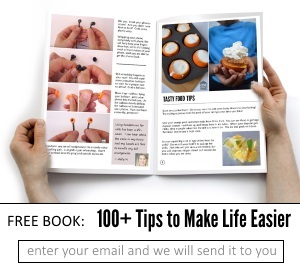 These recipes are easy to make and are a sweet confection waiting for you and your guests. 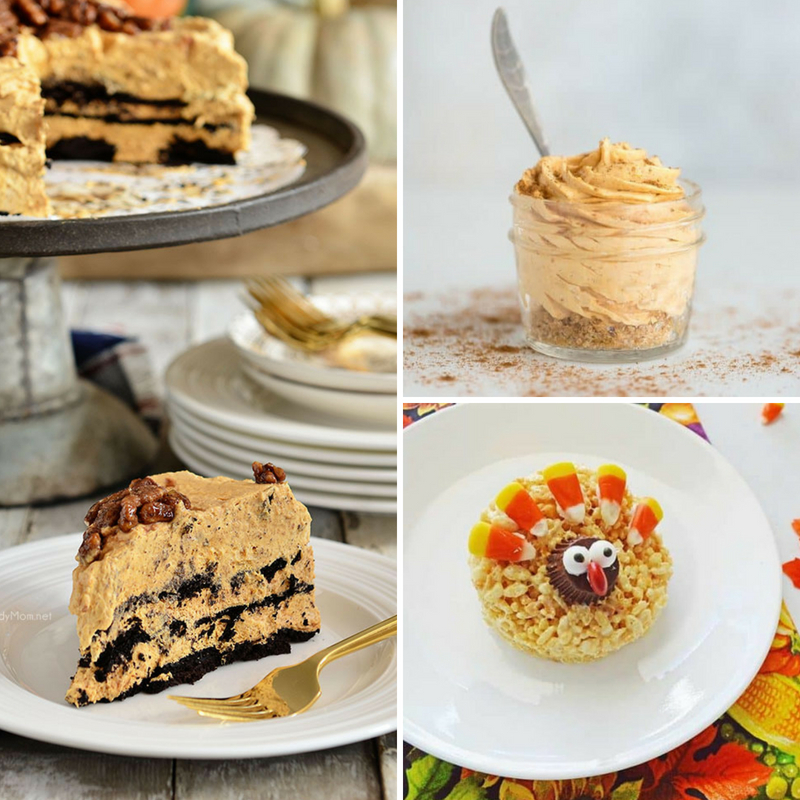 These Thanksgiving no-bake desserts are even great for holiday parties for work, your child’s school, and of course your family parties. If you have kids they will love to join in and help make these quick and easy desserts as well. If you are hosting a party, check out these hostess tips for the lazy! Gobble gobble! Whip up these turkey leg treats that are a Rice Krispies treat wrapped around a dog bone cookie that mimics the look of a turkey leg. Kid’s will go wild for this! Spectacularly sweet no-bake pumpkin spice cheesecake with a caramel drizzle and nuts sprinkled on top. Great for taking to potlucks, holiday parties, and enjoying as a treat. No Bake TWIX Caramel Apple Salad is a great dessert to whip up. Crisp green apples, creamy dressing with little bites of TWIX candy bars all throughout. 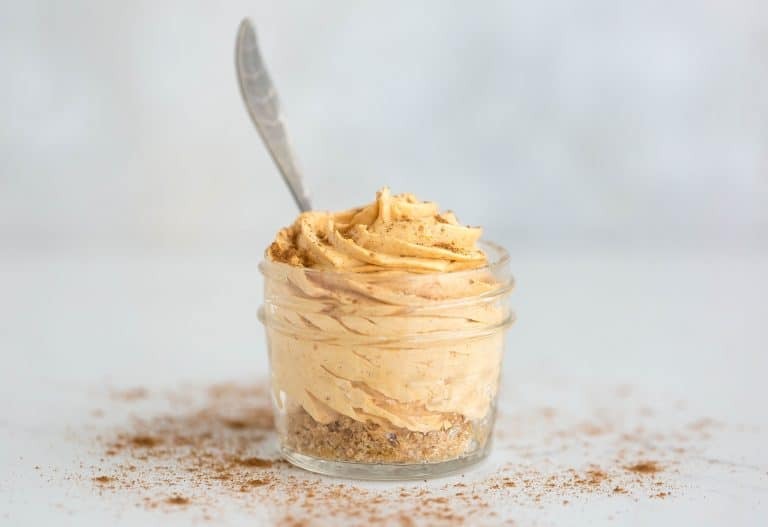 If you are looking for a pumpkin dessert check out these mini pumpkin spice no-bake cheesecakes. They are so creamy and smooth, and rich in pumpkin spice flavor. No Bake Caramel Apple Truffles are a different dessert to make. You get that mix of apple and caramel which is so popular in the fall season. Easy fluff pumpkin dip is always a tasty one to have for guests. They can dip graham crackers, wafer cookies and even fruit in for that satisfying pumpkin flavor. 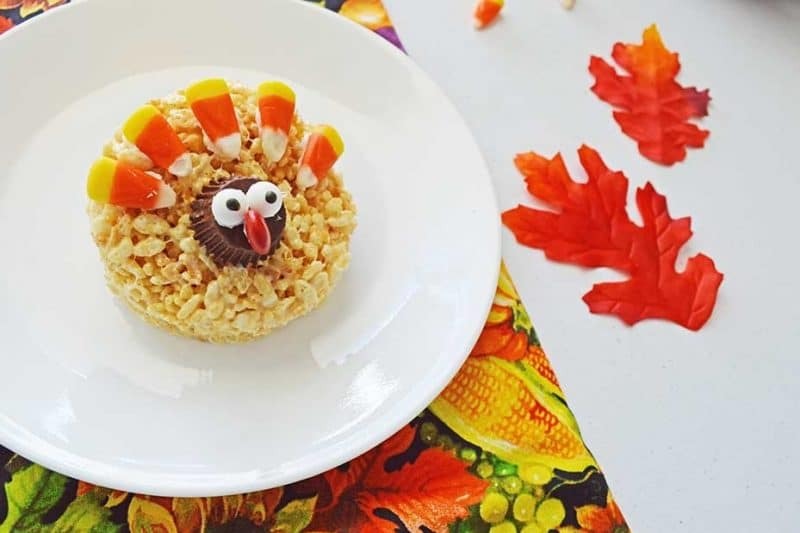 Another kid-friendly dessert is this Rice Krispie turkey treats. They are so fun and of course adorable. Use them as a table setting so each child gets their own turkey. Chocolate Coconut Balls will give you a nice bite size treat to serve up. They are rich in coconut, and have the perfect ratio of chocolate and coconut in each bite. Turkey Oreo balls are one of my favorites. Bite into this turkey ball and great a creamy and crunchy Oreo center! Here is a great icebox cake you might want to make. It is a pumpkin fluff icebox cake. 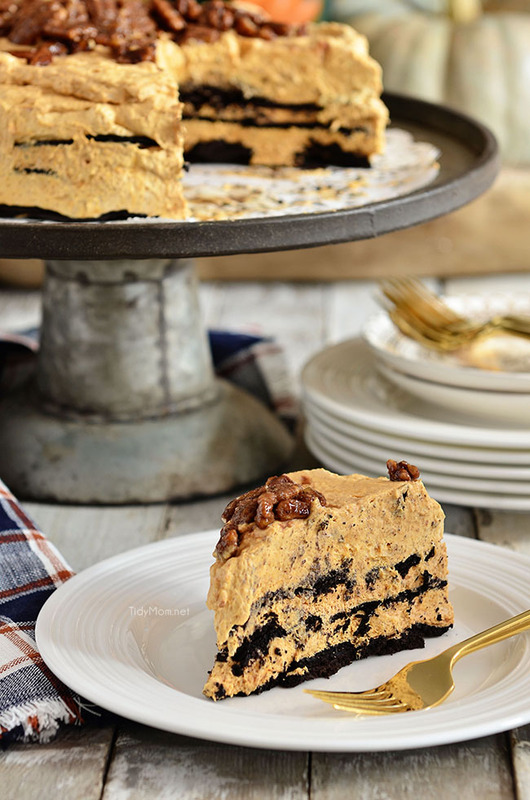 Layers of wafer cookies and pumpkin fluff filling, that is absolutely divine. Creamy frosted cranberry dessert is another great one, if you want to step out and not do pumpkin. You get that sweet and tart from the cranberry is a smooth and creamy filling. Scotcheroos are something we would have every holiday season, it was a staple in our home. You can make these with either peanut butter chips or butterscotch. We love the butterscotch recipe! Thanksgiving pilgrim hat cookies are another fun no-bake dessert. 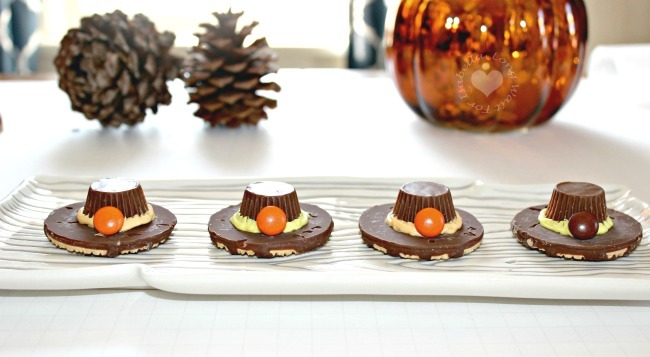 You use basic items like cookie, icing, peanut butter cups and transform them into a pilgrim inspired hat. Serve up this no bake Nutella tart. Just 5 ingredients is all it takes, and your guest will love it down to every little morsel that is left. Skip the traditional pumpkin pie, and whip up this Easy No Bake Pumpkin Silk Pie! Smooth, slightly tangy, and decadent, that gives you a mix of pumpkin in a cheesecake form. Pair these tasty Thanksgiving desserts with one of these 19 sparkling mocktails!